Tickets for the Strictly extravaganza are almost sold out. Get the the last few in Hannon’s, T. Ryan’s and Lenihan’s Fashions before they are gone. 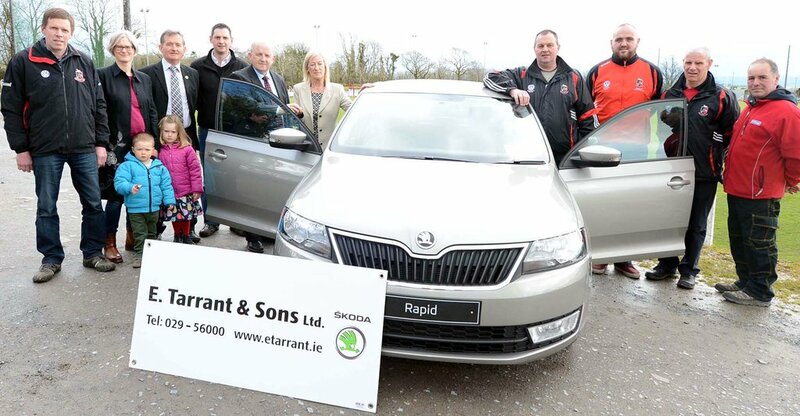 Congratulations to Bridie O’Sullivan of Newmarket, the winner in Cork GAA draw. 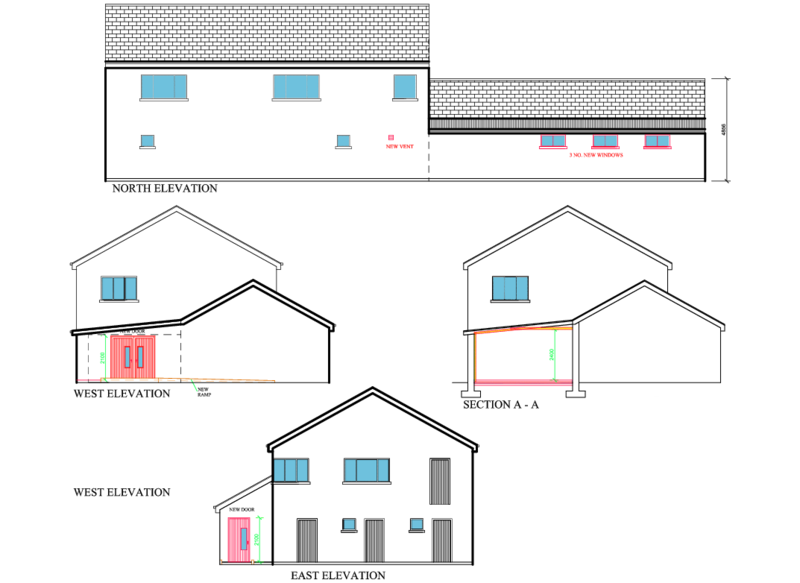 Newmarket GAA are delighted to announce plans to develop and expand our facilities in Priory Park. 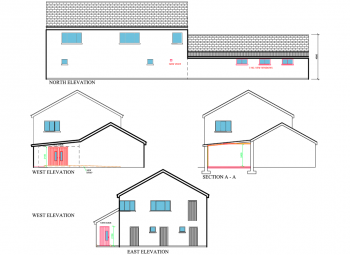 These developments will see the building of a new modern gym, ladies and disabled toilets along with the refurbishment and modernisation of two of the existing changing rooms. These upgraded changing rooms will be mainly used by our ladies clubs. This project is expected to cost approximately €70,000 and the club have secured a Sports Capital grant of €50,000 towards the overall cost. 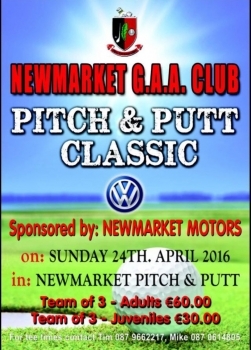 Newmarket GAA are hosting a P&P classic on April 24th. If interested, please enter a team via the contacts listed below. 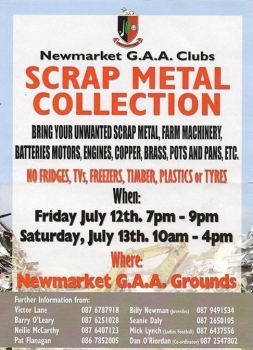 The club will be carrying out a fund-raising scrap metal collection this weekend. Farm machinery, household metal, car & tractor batteries, copper, aluminum, lead, stainless steel, window frames, motors etc. are very welcome. The collection will take place at the GAA grounds on Friday 2nd October 6:00pm-7:30pm and Saturday 3rd October 10:00am-5:00pm. Newmarket began their junior b league campaign with with a defeat to Knocknagree by 1-13 to 1-10 at a wet and windy Knocknagree on Wednesday Evening. Membership fees can be paid to any officer of the club. Robert Emmets under 21 football team got the playing season off to a great start when they recorded a 3-13 to 1-6 victory over Rathmore, played under floodlights in testing conditions on Saturday evening in Rathmore. The AGM of Club will take place on Friday the 28th November 2014 8pm, at the club rooms. 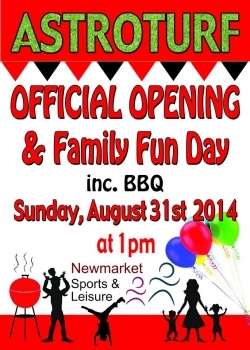 This Sunday the 31st, Newmarket Sports & Leisure are having the Grand Opening of the fantastic Astroturf facility in Priory Park. The family fun day beings at 1pm. All welcome! Congratulations to Michael Cottrell who played with the Cork minor football team who recorded a huge victory over Limerick in the Munster championship at Páirc Uí Rinn last Wednesday evening. T.J. Brosnan was a member of the Cork under 21 football squad that lost out narrowly to Roscommon in the All Ireland Semi Final played at Portlaoise on Saturday. Tonight at 7pm our Junior B footballers are at home to Cullen in the league. This team started their campaign last weekend in impressive fashion against Ballydesmond. In Dunmanway at 1pm on Sunday our intermediate footballers play Dohenys in the league at the Sam Maguire park. Its on to mallow on Monday night when the Duhallow senior footballers face imokilly in county championship. And on Wednesday night next our Junior B footballers face Boherbue in the league at 7 pm at Newmarket. Newmarket have been drawn against Kiskeam in the first round of the Cork County Premier Intermediate Championship 2014. This will be the fourth time that the sides will meet in the championship in seven years and the third time the sides have been drawn together in the first round. 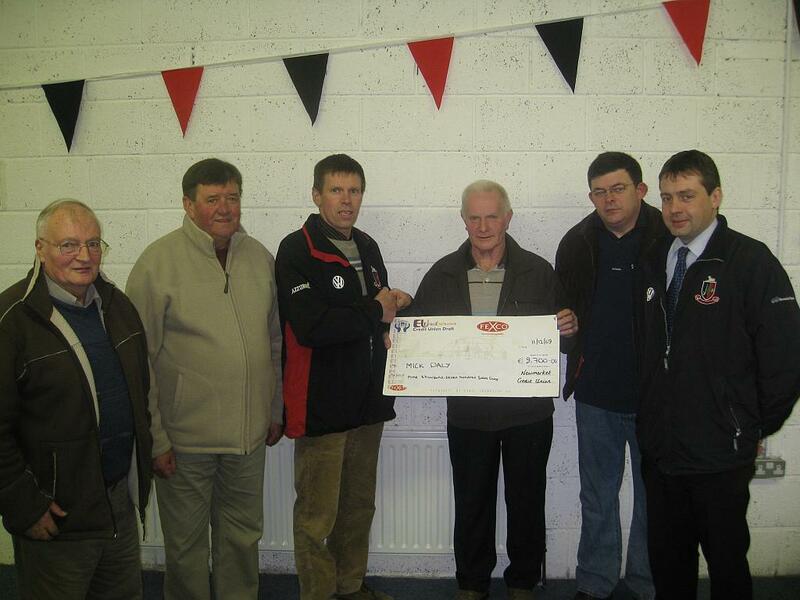 The Annual General Meeting of Newmarket GAA Club took place on Sunday afternoon in the Clubhouse meeting room. 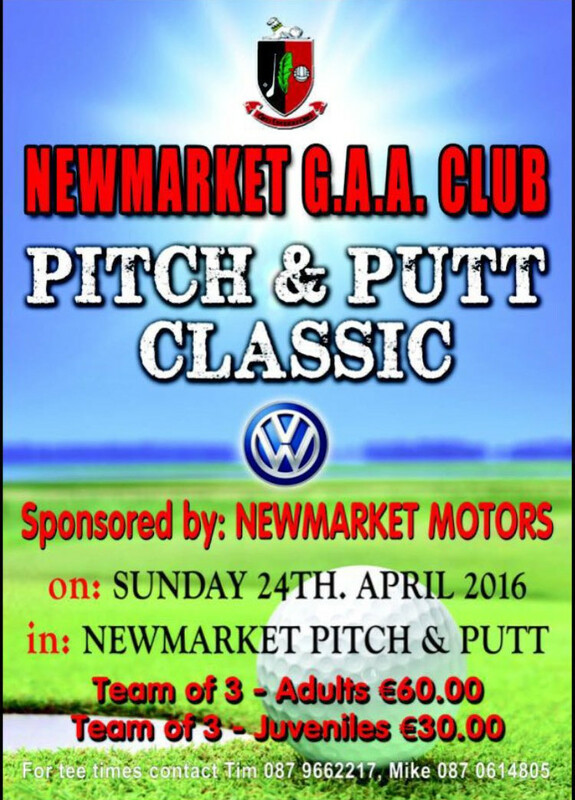 Newmarket GAA are running a draw for 2 stand tickets to the All Ireland Hurling replay and €100 spending money. Lines are only €3 each or 2 for €5. They can be purchased in local shops & pubs and from players & committee members. Proceeds to go towards fund-raising for gym equipment and lights for the training pitch. Congratulations to the Cork Junior Football team and to Newmarket selector Danny Culloty, who won the All Ireland Junior Football Final against Kildare at Limerick on Saturday evening. Congratulations to Donal Hannon who was introduced as an extra time substitute on the Cork minor hurling team that were eventually defeated by Waterford in the Munster Semi Final played at Páirc Uí Rinn last Wednesday night. In doing so, Donal became the first Newmarket player since 1974 to play for the Cork minor hurling team. 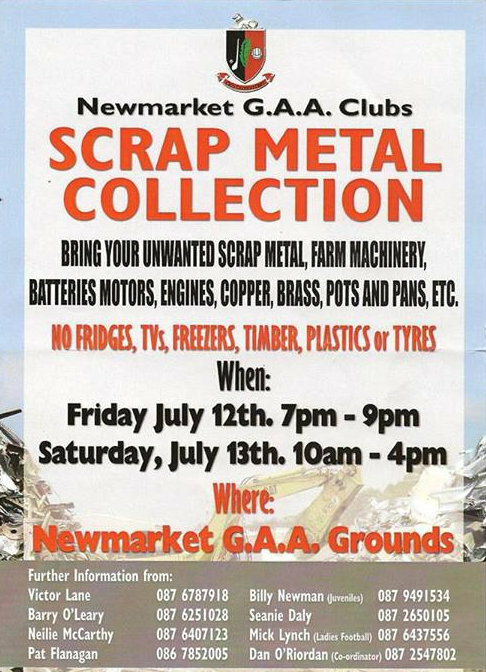 The Newmarket GAA clubs are running a scrap metal fundraiser on the weekend of July 12th/13th at the GAA grounds in Priory Park. Please bring any suitable unwanted items such as scrap metal, farm machinery, batteries, motors, engines, copper, brass, pots and pans etc. Best wishes to T.J. Brosnan and the Cork under 21 football team that will play Galway in the All Ireland Final at Limerick on Saturday evening at 7pm.